In September and the first part of October, we acquired our flock of laying hens. They are quite the hodgepodge of breeds. Or you could call them a nice barnyard mix. 🙂 We have an Easter Egger, Silkie, Barred Rock, Barnyard mix, 3 Cinnamon Queens, 2 Welsumers, and 6 Speckled Sussex. We prefer to raise White Leghorns because they are such prolific layers. Before our move to the Kenai Peninsula, we had four. Each of which laid an egg a day, even though the winter! During the spring and early summer months, we usually raise around 25 butcher chickens. In the past, we have chosen to raise Red Rangers for butcher. They finish out in 12 weeks weighing around 6-8 lbs. The boys raised several for fair this year. We are looking at experimenting with a variety of meat birds this coming year. Some people prefer to raise chickens which are multi-purpose. For our family, we have found it is more profitable for us to have two flocks: one for eggs and one for butcher. Our egg production had dropped, so over the weekend, we retired four of our laying hens. 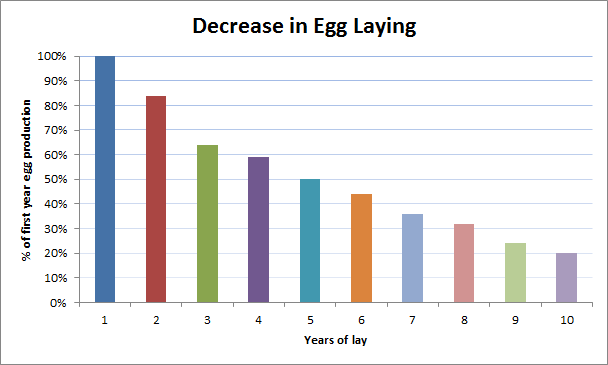 It’s typical for egg production to taper off in the winter months. There has been multiple studies done which show after a hen is 3 years old, their productivity decreases significantly. The kids and I spent several weeks running back and forth between the coop to try to catch the hens on the nest to see who was laying. When we did, we would take a zip tie, strap it loosely around their leg, and cut off the extra tie so it would not catch or hang up on anything. I had the brilliant idea that we should stick a game cam in the coop, then we could catch the chickens coming on and off the nests. I think this will be a new investment for spring when our young pullets start to lay: going to have to do a little research and find out what brand will work the best. The older the chicken, the tougher the meat. We make fairly quick and easy work of butchering the chickens. The kids do the catching, Mr. Roots is in charge of decapitating the birds, and I skin and remove the insides. Skinning is quick and easy. No messing with all those feathers! This summer, the boys were able to experience plucking birds they raised for 4-H and they did not enjoy it. The eldest is looking into how to build a chicken plucker for next year. The butcher chickens were packaged in shrink wrap bags I purchased online from http://www.poultryshrinkbags.blogspot.com. They worked great! You dip them in near boiling water and they shrink up nice and tight around the chicken. Looks very professional. For our older hens, I tossed them right into the stew pot. Cooked off all the meat and made broth. Then packaged the shredded meat into freezer zip lock bags in potions for making soup or meals. Homemade Chicken Noodle Soup is one of my kids’ favorite meals. Done with that chore till next summer when it comes around again!